The #1 difference between American and Japanese players is that Japanese players go for optimal combos that they never drop–as my brother Khoi has noted with interviews with foreign players. All of their setups are tightly practiced. I know that the only reason I was able to compete in Japan in Ultra Street Fighter IV was that I was playing Guile and his optimal combos are dead-easy to do now with the +1 on hit buff that they gave his jabs. Chaining jabs into a c.MP link, canceled into Sonic Boom or Flash Kick or s.HP link is no issue at all–leaving someone like me who doesn’t even practice SF4 Guile doing his optimal links 100% of the time. In addition, when the biggest Guile combos are along the lines of Focus Attack Level 2 > d/f+HK > Flash Kick, executing Guile at top-level is no problem at all. That combined with facing non-explosive characters was the only reason I was able to hang in Japan. You guys would have loved watching my Guile there since it felt like I rose up to the occasion versus just playing a very simple character. I’m sure if I played an Ibuki, Yun, Viper, etc.–I would not have stood any chance due to my lack of match-up experience and them always landing their setup or combo. Anyone with a high-ranking Nesica card would have put me on blast, I know the two Goukens with 5,000+ matches played on their cards did. Even random females and normal casual players play on the level of good tournament players in the United States because of their execution and knowledge of combos and setups. They’re so optimal that you can see the changes in combos all of the time. Let’s say you were playing a game with ABC combos and you typically fish with B and complete it with C into special and whatever else. Well in Japan, if it was a whiff, they’ll punish with C to lower the stun scaling, damage scaling, and potentially open up different follow-ups 100% of the time. This may sound like common-sense, but many players in the United States started with games where starting their combos with A or jabs is considered optimal (or near-optimal anyway). But if Japanese players can get 50 more damage in a 2500 damage combo, they will do it. Lets not even get started with meter as they’ll have ways to properly do meterless combos, use 25% meter, use 50% meter, use 75% meter, use 100% meter, and use 150% meter along with burst extensions in games like Persona. They will even have variations for complex setups if they’re giving up damage. This means that most Japanese players have 3-5 combos for the 5-10 main situations (from jabs, from long-ranged pokes, from counter-hit, from whiff punishment, from air-to-air, from ground to air, from air-to-ground, from throws, from overheads, etc.) in which they get combos. Sagat vs. Abel? Yeah, I’ve fought this match up many many times. The overlap between rhythm game players and fighting game players definitely exist. I suppose the reason for this is that executing rhythm games and doing combos aren’t so far apart. You can even see this changeover if you’re there during the afternoon where many rhythm game players oftentimes migrate to the fighting game floor later in the evening and at night. Players stand up after they lose 100% of the time. You stand up, look around the room to check out if anyone is waiting on your cabinet and if there aren’t any, you can sit back down and play again. This etiquette is key in Asia and is the way you respect other players who are waiting to play. 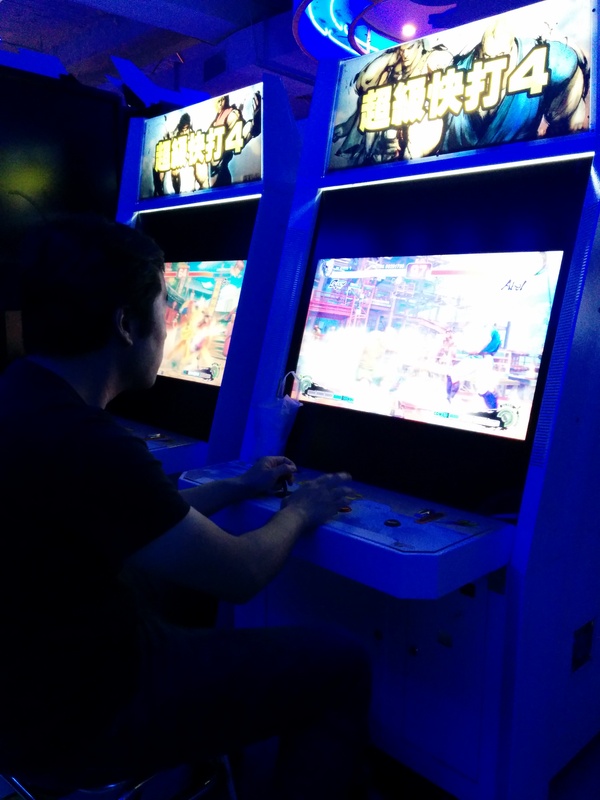 Funny enough, games like Persona 4 Arena Ultimax (PS3)–where they have virtual arcade lobbies–show the characters standing up off the cabinet and having you wait to sit back down to simulate how proper Japanese arcade etiquette work. You may also have people putting 100YEN down if the turn around is fast or super popular. 100YEN either gets you 1 credit in a fighting game (arcade route, score attack, versus, etc.) that is 3/5. If the game is 2/3, you will get 2 credits for your 100YEN, effectively making it 50YEN per play. There are only a few main exceptions like Tekken Tag Tournament 2 being 3/5 (since that’s normal for 3D fighters) and also 2 credits for 100YEN. Most new popular games for arcades are set at 3/5 for 1 credit at 100YEN. In popular arcades that play Guilty Gear, you’ll often see Guilty Gear Xrd cabinets and Guilty Gear AC+R cabinets side by side because people still want to play characters that they can’t in GGXrd. People playing Guilty Gear Xrd! Note that Sol and Ky are VERY popular. People do smoke in certain arcades (and there are even ashtrays because they know it happens). Smoking and non-smoking floors are designated usually by the stairs. Arcades that have zero smoking sometimes offers full meals and drinks on certain floors. Capsule toys and gashapon still sell quality toys in Japan since the culture is there. This leads them to mostly being around 300YEN ($3) rather than the cheaply made toys, oftentimes stickers or putty hands, that you find in America. 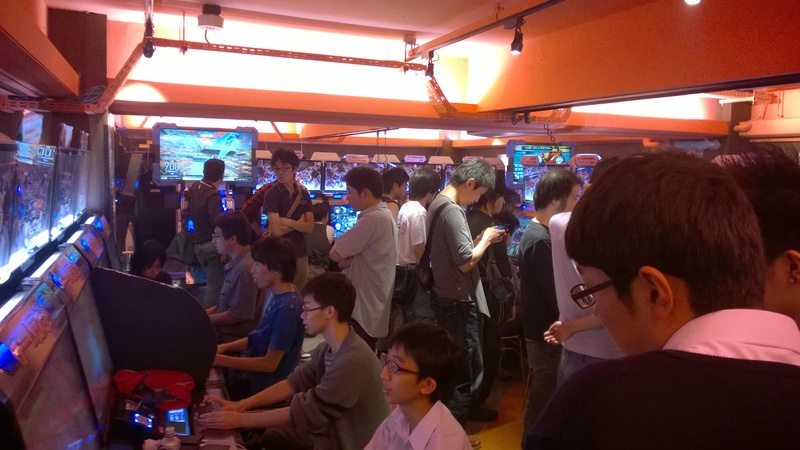 Arcade operators will change the game in Nesica cabinets when tournaments are running for additional setups. 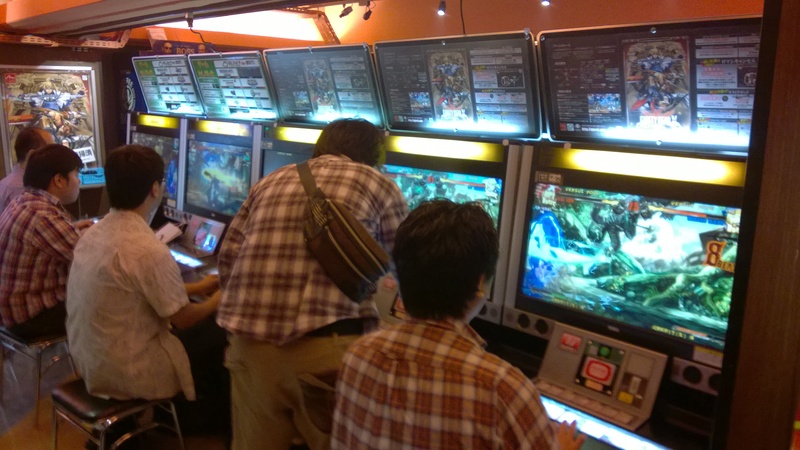 I was there during a 3v3 Dengeki Bunko Fighting Climax tournament at Sega Akihabara and they cleared all the machines running Guilty Gear Xrd, Persona 4 Arena Ultimax, BlazBlue Chrono Phantasma, Dead or Alive 5 Arcade, etc. to Dengeki Bunko Fighting Climax until the tournament ended. And yes, I saw a lot of crazy high-level play in Dengeki Bunko Fighting Climax. 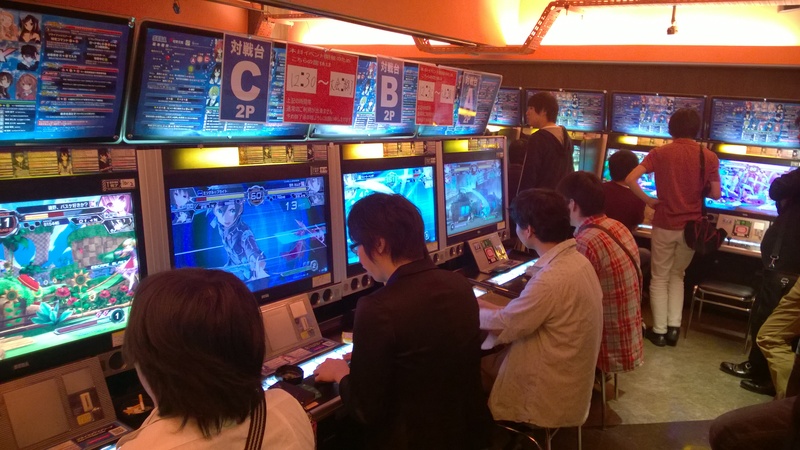 Side shot of the Dengeki Bunko Fighting Climax 3v3 Tournament. Almost all fighting game cabinets featured Sanwa Denshi joysticks and Sanwa Denshi buttons (non-clear and non-silent). However, these sticks are way more loose (not broken at all) and require less force than the stock Sanwa sticks that you find in commercial products in America–either due to use or lighter springs. If I were to replicate what a Japanese cabinet felt like, I’d undoutedly use HORI’s Hayabusa stick (since that feels like what Sanwa sticks feel like over there stock) as well as using Sanwa Denshi buttons (non-clear and non-silent). Alternatively, you could just play on your Sanwa stick a lot and loosen it up or try to find a lighter spring. Khoi told me later that the Street Fighter III: Third Strike cabinets featured Seimitsu sticks likely due to parrying. Always push the stool that you’re using back in after you’re done playing. I saw lots of foreigners play, leave their stools out, and arcade operators having to make the rounds to push them back in so that the aisles stay zen and spacious. Don’t be one of these people. I got a lot of matches with this dude in Dead or Alive 5. He’s easily one of the best players I’ve played there at a-cho, sporting a Leon, along with a Hayate across from him. They both had more than 4,000 games played on their cards each. Your significant other, family member, or friend sitting at stools is totally fine when the arcade isn’t lively. 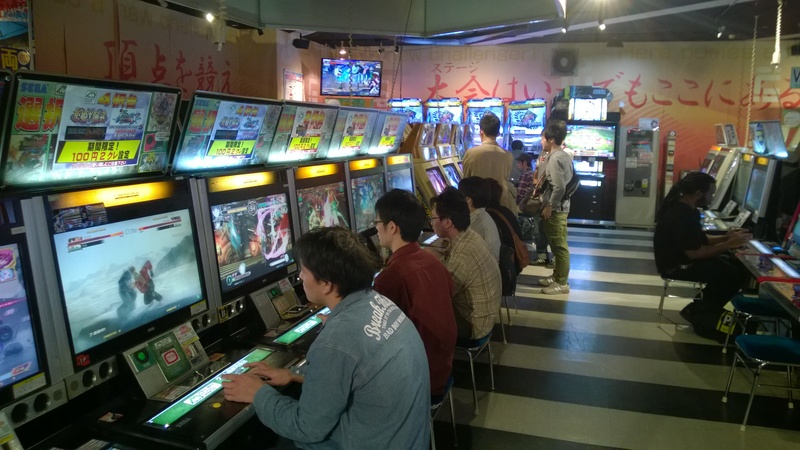 However, when it even has a moderate amount of people or if your buddy is sitting at a the single open cabinet for a particular game, arcade operators will request that they stand up and leave the seat to attract potential customers. Arcades are open way later than any other business (besides the seedier ones I suppose). Plan to visit arcades after you’re done with shopping, sight-seeing, and dinner as they’ll still be open then. Playing in the arcades during the day on weekdays is really only productive if you plan to play single-player. It is typically in good form to buy vending machine drinks that you’re drinking at the arcade, at that very same arcade. Recycling bins for bottles are also located next to vending machines a well. Taking pictures is only allowed in arcades when taking pictures of friends, family, etc. This is such a big concern in terms of culture that they even have signs in English that say so since foreigners break the rule so often. That didn’t stop me from taking pictures of random people though. So there. Also, taking video is always restricted, friend or not. Nothing will stop me from taking pictures of random people! Not even a 3v3 Dengeki Bunko Fighting Climax tournament! So there you have it guys–I’ll likely update this post and include more facts if I think of any. As someone who hopes to travel to Japan for Street Fighter practice one day, this was a great read. Please keep it up. Thanks for reading Matt–I’ll try to get back to posting on the blog!